With its non-stick copper interior, this stylish casserole pot is the perfect way to make family-sized casseroles, chillies, soups and more, without the hassle of having to scrape it clean afterwards. With a highly effective double layer of PFOA & PFOS-free coating on the pan's interior, this casserole pot won't give food a chance to stick. This allows you to cook healthily with little-to-no oil and makes washing up easy. Ensure a secure grip for easy carrying. Drain excess water without using a separate colander. Oven safe to 480°F. . Suitable for use with any hob type, and oven safe up to 480°F, this casserole pot is perfect for home chefs who want to utilize the power of hob-to-oven cooking. 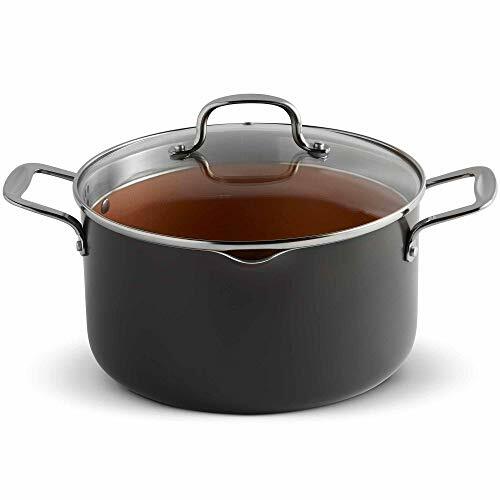 Combined with riveted steel handles and a tempered glass lid, this casserole pot offers excellent performance and is built to stand the test of time. VERSATILE - oven safe up to 480°F and suitable for all hob types including induction - ideal for home chefs who want to explore the potential of hob-to-oven cooking. Dimensions: L14" X D8" X H5".